We normally have Bunco on the first Friday night of the month but August has special circumstances because 2 of the ladies in our group are having babies and they are both due on the EXACT same day! Anyway, we didn't want to search for others to replace them so our fearless leader Kathleen made the decision that we were going to dinner and a movie. 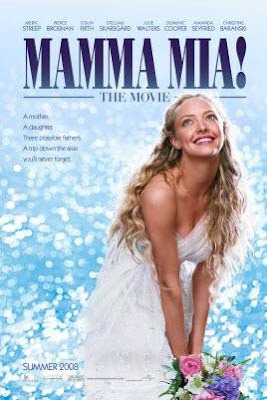 The movie was called Momma Mia. It's a story about a mother of the bride and her two long-time friends, a bride in search of her father, and three entertaining candidates for walking her down the aisle. The show probably qualifies as a "chick-flick" but I suspect anyone in the audience would at least enjoy the captivating music from the 70's group, ABBA. Let me know if you see or have seen the movie and what you think. I give it 4 out of 5 stars because it was pretty good but not terrific. Not a movie for kids to see...at least I wouldn't let mine. The scenery was BEAUTIFUL and the costumes were really fun and some were funky! I changed my playlist to just a couple of the Momma Mia songs to get you into the mood. LOL!!! The Momma Mia song is really catchy and just sticks in your head and you can't get the song out of your head...I was singing it all day to myself. Dancing Queen is the same way. In a week or 2 I will go back to the other playlist until then either listen to the music or pause it....you can thank me later for all the random singing you will be doing around your house this week!!! LOL. Let me know if you has this sudden urge to jump up and start dancing like they do in the movie. Me and a coworker took 2 of the ladies we take care of to see it. I really liked it. The only bad thing was we had to sit n the front row because handicap seating was taken...and with all the dancing i got a bad headache and my stomach was turning!! !But, 1 of the ladies knew every song and sang the whole time. I would give it 4 out of 5 stars! !